Sometimes, when it snows, I crave warm, comforting winter foods. Spicy soups, hearty stews, cheesy quiches, and yes, syrup-drenched pancakes. Other times, mid-snow storm, I’ll find myself with a hankering for summer sweetness. I’ve been known to bake up a batch of blueberry corn muffins in a blizzard, and always keep a pint of strawberry ice cream in the freezer for snow days. I spent the last week in Florida for work, and came home yesterday to this winter wonderland. Sweet, juicy oranges and pretty pink grapefruits were everywhere in Florida. So, of course, I stuffed a few in my suitcase. I’m glad I did because as soon as I got home, I was craving the sunny, bright orange flavor. But, as expected, I was also in the mood for a hearty winter breakfast. I love quinoa, and often cook up a big batch all at once. Leftover cooked quinoa is great in pancakes, of course, but also adds bulk to salads, makes for a tasty omelet filling, and is delicious as a breakfast porridge when heated with a bit of milk and honey. You could certainly play around with the flavors here, and other fruits as well. Adding some banana slices and a handful of raisins to the pancake batter would be yummy. But for today, I’m all about the Florida citrus! 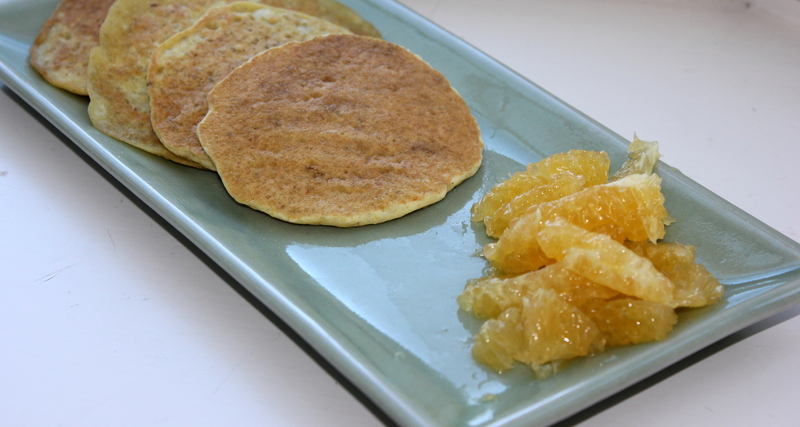 These pancakes don’t have much sugar, but if your oranges are good and sweet, just a tiny drizzle of honey is all it should take. Sift together the flours, baking powder, salt, sugar and cinnamon. In another bowl, wisk together the milk, oil and egg. Stir the dry ingredients into the wet, and stir in the quinoa. Zest both of the oranges, avoiding the white pith, and add the orange zest to the batter. Set the batter aside and let it rest for a few minutes. Meanwhile, peel the remaining pith from the oranges, and cut the orange segments between the membranes, into little slices. 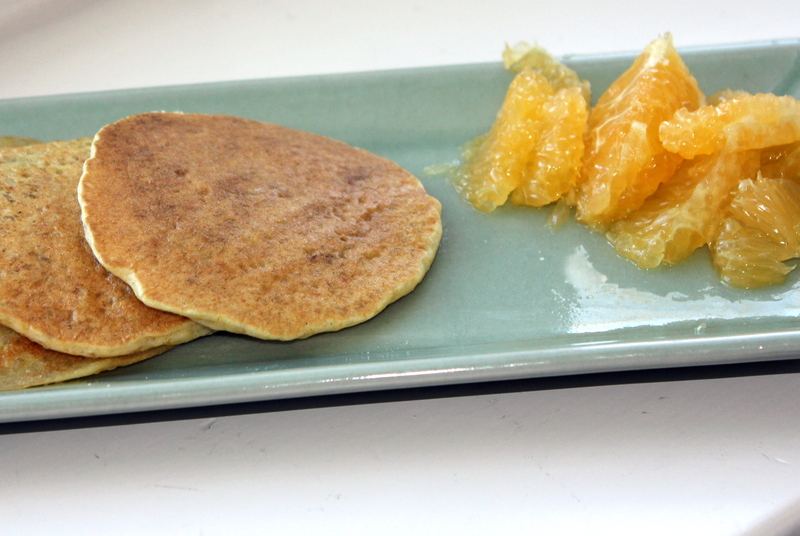 Drizzle the orange segments with the honey and set aside. Heat a greased nonstick skillet (or griddle) over medium heat. Spoon a scant 1/4 cup of batter per pancake into the heated greased pan and cook until the edges firm. Flip and cook another two minutes until golden. Continue to cook the pancakes in batches. Serve warm topped with the orange and honey mixture. Let me start out by saying that this is not a vegetarian black bean soup. 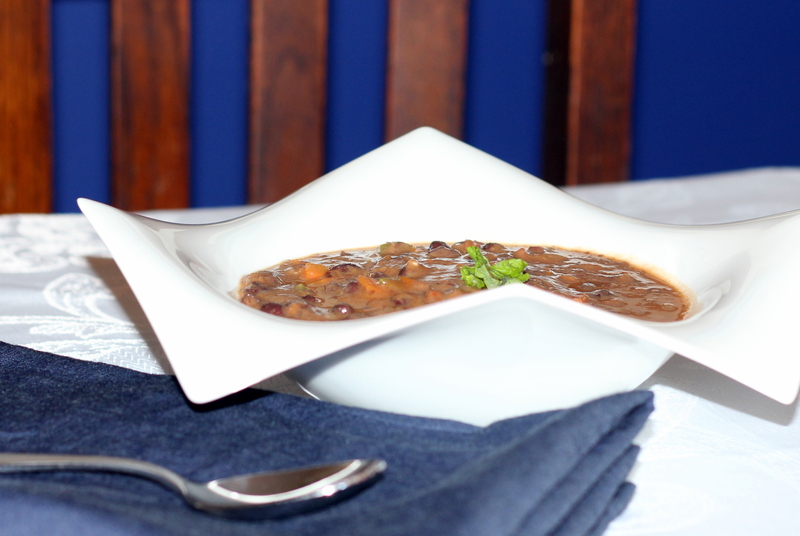 There are a lot of wonderful vegetarian black bean soup recipes out there, but this is not one of them. This soup is rich, intense, and full of meaty flavor. So full of flavor, in fact, that it really needs no adornment. I top most black bean soups with a sprinkle of feta, a wedge of lime, a dollop or sour cream, a drizzle of chili oil, or a handful of red onion. But with this soup, even a sprig of parsley is really overkill. The key to building rich and meaty flavor is using both the capocollo and the beef stock. If you don’t have capocollo, which is cured pork shoulder or neck, proscuitto will work as well. Really good beef stock is essential here. Actually, I kind of think it’s always essential. The stuff from a can is pretty much salty water – better to use water. But home made stock is not always an option. A number of local markets in my area sell house made stock, which is wonderful. It’s usually found in the freezer area and makes all the difference in the world when you don’t have time to make a batch of your own. In a pinch, high quality soup base works too (I’ve used Penzeys with good results). As for the beans, canned or dried – both work great. In terms of taste, and even texture, I think the difference between canned beans and cooked dried beans is minimal. 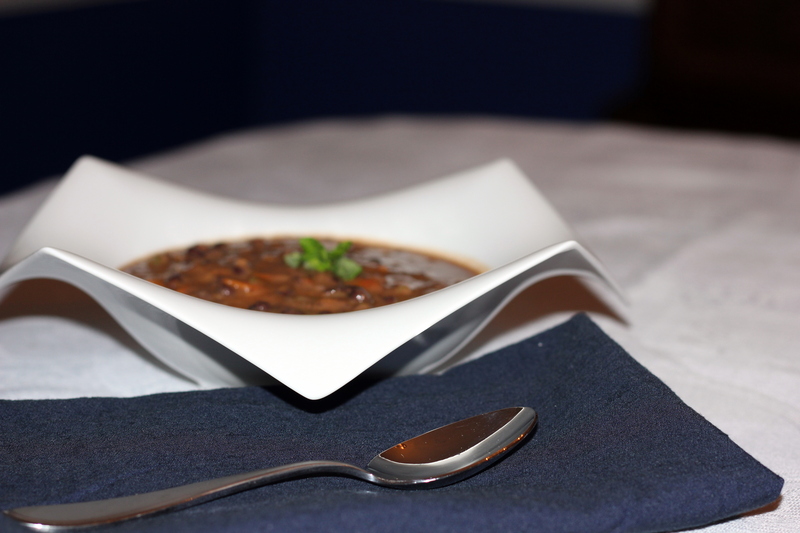 But dried beans are incredibly economical, and also have much less sodium than the canned varieties, so I like to cook up a big batch and use them to make hearty soups, main-dish salads, flavorful dips and even filled omelets. To cook most kinds of dried beans, rise and then soak in water overnight. Then drain, add new water, and boil until tender. The beans will keep for a few days, even up to a week, in the fridge. My friend Julie even cooks and then freezes batches of beans, but I have to admit that I have yet to try freezing, although it does sound wonderfully convenient. All of that is to say that this can be a great, quick, weeknight meal. A few cans of beans and a bit of gourmet store-bought stock and you have dinner on the table. Or, you can take your time. 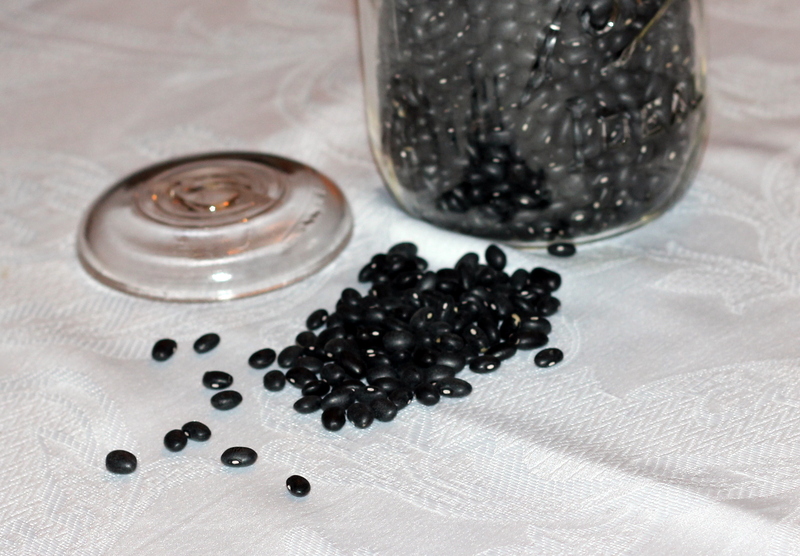 Cook up a big batch of black beans, make your own stock from scratch. Either way, the results will be fantastically tasty! And this soup reheats well – that is, if you have any leftover. Heat the oil in a medium sized pot. Add the onion and carrot and saute over medium heat until the vegetables begin to soften, about 5 minutes. Add the pepper, garlic and capocollo and continue to cook, stirring, until the capocollo starts to brown, about 10 minutes more. Add the tomato puree and reduce the heat to medium low. Stir in the beans and the stock. Simmer for 30 minutes. Transfer two cups of the soup to a food processor and puree. Return the puree to the soup pot and stir well to combine. If you like your soup smoother, puree more than two cups. Season to taste with salt and pepper and serve hot.